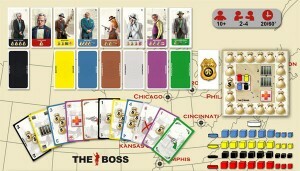 The Boss is a gangster-themed game. Players place cubes on city cards and the player with the most cubes on each city card at the end of each round gains a reward; however, what reward will be gained each city’s winner is only revealed during the round. 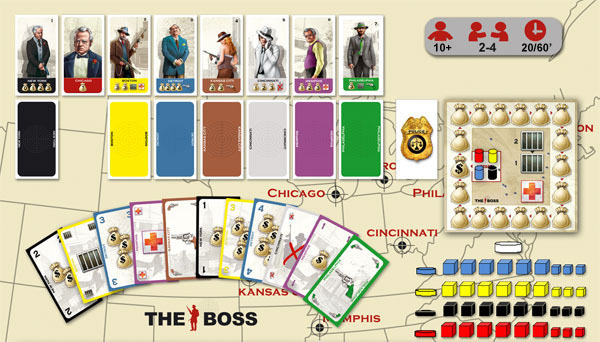 The rewards are revealed because each city has a fixed set of possible rewards and players take turns placing cards next to each city which show which rewards are not the one that will be gained by the city’s winning player. So, the game’s a sort of are control game but the reward to be won is a process of elimination. Some of the rewards are actually bad things like one of your men (cubes) is killed or out of the game for a turn. It sounds relatively simple but quite inventive and with a deductive element. Sounds like calculating when to strike and take control of a city will be important. I’m hoping it has enough meat to it but the game mechanic appeals to me that I will definitely give it a try.